Uwe (Oo-vay) Kruger, lead vocalist and guitarist, has been playing music since early childhood. When they were very young, Uwe and younger brother Jens placed a guitar on the floor between them and played it together, one brother taking the upper three strings and the other the lower three. Uwe was introduced to American folk music through the brothers’ father, who would return to Switzerland from business trips to the United States with folk music records. 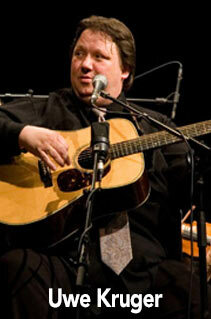 For more than twenty-five years Uwe has been playing guitar and singing as a professional musician. Performing in Switzerland’s relatively limited music market required Uwe to develop versatility, and he became proficient on other instruments including the electric guitar and the banjo. Today, Uwe astonishes audiences with his blend of guitar styles. His rich, resonant, and mellow baritone voice has an uplifting affect on all who hear him sing. Diverse influences range from Doc Watson, Jerry Garcia, and Eric Clapton, to Beethoven, Bach, and Brahms. Uwe’s unique style, a blend of flat picking and finger picking, is an experience to behold.